Flanked by representatives from other unions, United Mine Workers of America President Cecil Roberts speaks to the crowd at a rally in downtown St. Louis on June 17, 2013. The agreement provides more than $400 million to provide health coverage for retirees affected by the bankruptcy of Patriot Coal. The money will go into the Voluntary Employee Benefit Association or VEBA account. Peabody will make payments totaling $310 million over the next four years, and proceeds will be applied to future retiree health care benefits. Patriot has agreed to contribute $15 million to the VEBA in 2014, with up to an additional $60 million to be paid into the fund over the following three years. The union has agreed to give up its 35 percent stock as part of this new deal. UMWA was given 35 percent equity stake in Patriot in May as part of a ruling. The same ruling established the VEBA account. UMWA continues to look to Congress to assist in securing additional funds for health care benefits. 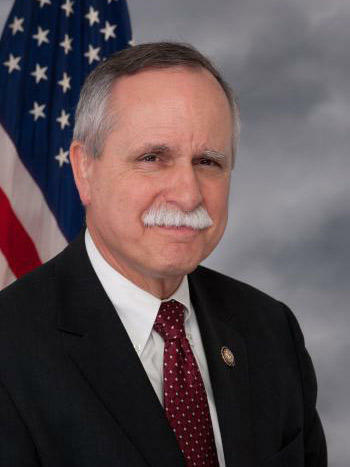 Rep. David McKinley introduced a bill in the house that currently has 24 co-sponsors from both parties and a bill introduced by Sen. Jay Rockefeller currently has six co-sponsors. UMWA is still hoping to come to an agreement with Arch Coal, another company that formed Patriot. Patriot has reached a final deal with Arch Coal. According to a release, Patriot will receive $5 million in cash and a release of a $16 million letter of credit posted in Arch's name as part of the deal. In a release issued just after midnight Thursday morning, UMWA president Cecil E. Roberts said he was pleased. "This is a significant amount of money that will help maintain health care for thousands of retirees who earned those benefits though years of labor in America's coal mines," Roberts said. "This settlement will also help Patriot emerge from bankruptcy and continue to provide jobs for our members and~thousands of others in West Virginia and Kentucky." Patriot President and Chief Executive Officer Bennett K. Hatfield echoed the union's satisfaction. "I am pleased that we have been able to reach agreements that provide the UMWA with hundreds of million of dollars in retiree healthcare funding," Hatifield said. "The best result for the UMWA and its members is for Patriot to emerge from bankruptcy as a healthy company that will continue to provide jobs and benefits, and we are now on track to achieve that goal." This deal still needs approval by federal bankruptcy judge Kathy Surratt-States. The judge is expected to make that decision early next month. As the benefits for retirees remain in limbo, a federal court dismissed an attempt by the union to secure health coverage. Federal Judge Joseph R. Goodwin has dismissed a case meant to force two coal companies to pay for retiree health care benefits. Peabody Energy and Arch Coal created Patriot Coal, which filed for Chapter 11 last year. The United Mine Workers of America says it will take an act of Congress and Peabody and Arch providing significant resources in order to secure long term funding for miner benefits.